I really, really adore grilling weather. Now that it’s warm enough to grill, I get super annoyed when we have rainy weeks. It’s like, c’mon Mother Nature! We’ve only got limited time to begin with! I’m also feeling a bit of a time crunch because I don’t know how cooking will go once baby boy arrives. I don’t want to set too many expectations for things to do after – so I’m trying to tackle some of my must-make recipes now. Of course, kabobs always seem to top the list. These were another huge hit. Unlike some of the other kabobs I’ve made, these are flavored with spices instead of sauce which makes them a bit healthier. We loaded the skewers with veggies and served them with rice for a full meal. In a bowl, whisk together the olive oil, vinegar, lime juice and spices. Add the chicken and turn to coat. Cover and refrigerate for at least an hour. Chop veggies into bite-sized peices. Preheat the grill for medium-high heat. 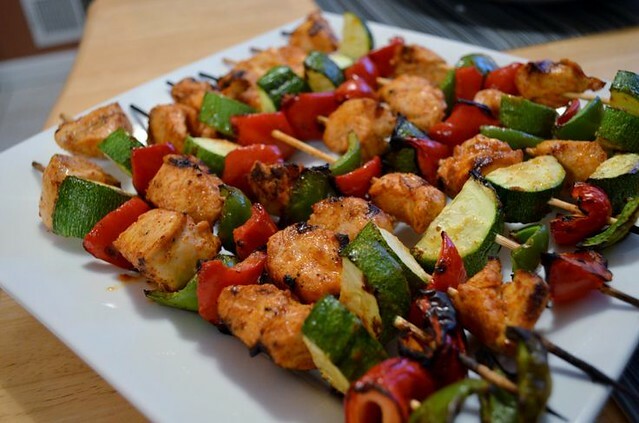 Thread chicken and veggies onto skewers. Grill for 10-15 minutes, turning halfway through, until the juices run clear. This recipe looks great – better than the one you linked to, for sure!